ARLINGTON, Texas - As days turned into weeks without a home run, Adrian Gonzalez insisted he was not worried. He pointed out that his batting average was higher than usual and that eventually the power would return. There was evidence of that in Kansas City last week when three swings produced drives to the warning track. Gonzalez took those outs as a sign of what was to come. That time has come again. Gonzalez homered twice last night and drove in three runs, lifting the Red Sox to a 6-0 victory against the Texas Rangers. That’s five home runs in three games for Gonzalez. Both home runs last night came on first-pitch fastballs from Alexi Ogando. Going back to Wednesday night, Gonzalez homered on three consecutive pitches. Boom, boom, boom. So much for those questions about where his power had gone. Confidence plays a role in that kind of accomplishment, even for a hitter with Gonzalez’s credentials. Gonzalez hit his first home run in the first inning, driving it onto the grassy hill beyond the fence in center field. With a runner on and one out in the third inning, Gonzalez again lashed at a fastball and drove it to left-center field. It landed 448 feet away, his longest shot of the season. Dustin Pedroia, watching from the on-deck circle, was impressed. “What’s it like? It’s awesome. It’s beautiful. I like home runs,’’ he said. 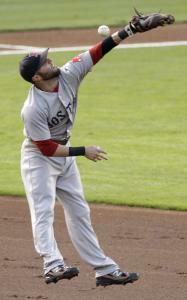 David Ortiz and Jarrod Saltalamacchia also homered as the Sox took a 6-0 lead for the third straight game. For Ortiz, it was his 25th home run of the season. He has hit 25 or more in eight consecutive seasons, second only to Ted Williams (14 straight) in franchise history. Ortiz had been tied with Jim Rice. Andrew Miller (6-1) ran with the support, pitching his best game of the season. The lefty went 6 1/3 innings, allowing three singles with two walks and six strikeouts. It was the longest start for Miller since July 4, 2009, with the Florida Marlins. Inserted back into the rotation last week because of a busy schedule, Miller has given up one run on six hits over 11 2/3 innings with four walks and nine strikeouts. “Against a lineup that’s pretty dangerous, he did a really good job,’’ manager Terry Francona said. Alfredo Aceves and Dan Wheeler finished the game as the Sox handed Texas only its second shutout at home all season. At 80-50, the Red Sox are 30 games over .500 for the first time since the end of the 2007 season, when they were 96-66. They are the fastest Sox team to 80 victories since 1978. The Sox maintained a one-game lead on the Yankees in the American League East. Trailing, 7-1, the Yankees came back to beat Oakland, 22-9. After losing, 4-0, on Monday, the Red Sox outscored the Rangers, 30-7, over the final three games of the series. It was their first series win at Texas since Sept. 5-7, 2008. “The thing was they whupped our butts for three days,’’ Texas manager Ron Washington said. “We couldn’t pitch to stop ’em and we couldn’t get anything going offensively. Their pitchers stopped us and we didn’t stop them. The Sox return home tonight having gone 6-2 on their trip. They are 42-26 on the road with 93 home runs, the most in the majors. The Sox went 10-7 in a stretch of games that included 14 on the road, many with a lineup depleted by injuries. That they emerged in first place and playing well was satisfying even to Francona, whose vision rarely exceeds the game at hand. Names Is that Herb Chambers, Biz Markie, and Youk?